The Fellowship was fortunate enough to obtain a copy of JIRNI #1 from Aspen Comics. J.T. Krul writes and Paolo Pantalena draws. Ara is on a quest to find her mother. Seems simple enough, but there are complications. For starters, her mother is a deposed queen, and Ara doesn’t know if she’s still alive. Also, Ara doesn’t really know all of her own abilities yet (this is a fantasy world, after all). And she’s not sure what she’s going to do when she finds Mom; the sorcerer who killed her father still rules. And now she’s got a new friend to help her. This is a simple quest story, but keep in mind that the reason we still write them is that they still work. This one is starting to build a new world for us to explore as well, and is introducing us to new characters to get to know. And then, of course, there is the art. This is quite simply a beautifully drawn book. The expressiveness is just amazing, and the combat scenes are especially well done. So if you’re ready to explore a new world, pick this title up. There’s plenty of food for growth here, and the art is eye-popping. 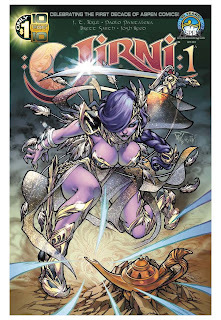 JIRNI #1 is available now at your FLCS or by order at aspencomics.com.